The potential for the eruption of a ‘supervolcano’ – or the threat of one – regularly makes headlines, especially in the wake of the travel disruption caused by the ash cloud from Iceland’s Eyjafjallajokull volcano in 2010. And while the chaotic scenes and devastation foretold in the media are at best unlikely, a large eruption is something which is a possibility and is one of just many scenarios which experts must plan for. Such an event has only recently been included for the first time on the UK’s National Risk Register, in which it is considered to have a relatively high potential impact (4 out of 5), with the chance of occurring within the next five years estimated at between 1 in 20 and 1 in 200. It’s with this in mind that the UK government established a Scientific Advisory Group in Emergencies (SAGE) with the remit to look at how the UK might respond to future eruptions. This ongoing project draws together a range of scientists from different disciplines, all of whom contribute to characterising the risk to the UK should a large-magnitude fissure eruption occur again. In 2012, the British Geological Survey (BGS) published a report into the possible source of such an eruption and ways in which civil authorities might handle it. They focussed on one of the more extreme possibilities – a long-lasting, large-magnitude event generating huge volumes of lava and producing significant quantities of gases with regional and possibly global effects. A ‘Laki-type’ Eruption – How Big and How Often? Despite the headlines, Iceland has no supervolcanoes. A supervolcano is one which is capable of producing upwards of 1,000 cubic kilometres (240 cubic miles) of erupted material and eruptions of this scale are thankfully extremely rare (occurring on a timescale of tens of thousands of years). They are assigned a magnitude of 8 on the (logarithmic) Volcanic Explosivity Index. 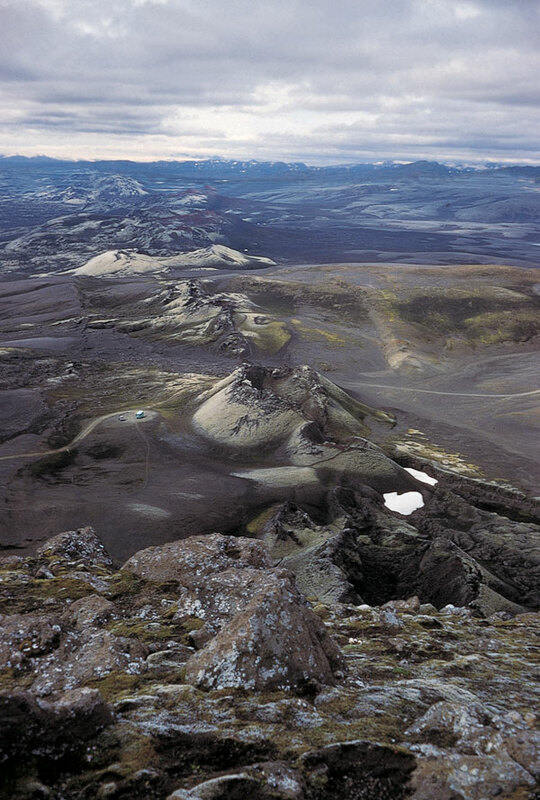 The eruption scenario considered is based on the historic Laki eruption in Iceland in 1783-4, which is assigned a VEI of just 4 – a fraction the scale of the true supervolcanoes. That said, a Laki-type event is unquestionably significant; even a VEI4 eruption merits the description ‘cataclysmic’. (A supervolcano, for the record, is ‘mega-colossal.) The original Laki produced around 15.1 cubic km of material and lasted for eight months. More crucially in terms of its wider impacts, it emitted huge quantities of sulphur dioxide, hydrogen chloride and hydrogen fluoride gases. How imminent might an eruption be? Volcanoes don’t follow a pattern, so predicting the timing of a major eruption is an unrealistic goal, certainly at the moment. What we can do is take a lesson from history. Iceland has experienced just two eruptions larger than Laki since the end of the last ice Age – the Eldgja eruption in the mid tenth century and the Thorsja eruption, dated to around 8,600 years ago. So these eruptions are not common; but they are possible. What were the impacts of Laki? “According to historical data,” the BGS’ Dr Julia Crummy tells Decoded Science, “there were higher than usual deaths recorded in 1784, and extreme temperatures were recorded (hotter than usual summer followed by a colder than usual summer).” These climate impacts produced extreme local effects: in their book Volcanoes, Francis and Oppenheimer describe a “dense blue acid haze” in Iceland, while much of western Europe was blanketed by fog “so dense that it dimmed the Sun” and Scandinavia was blighted by acid rain. The remit of the study – and others like it – is not to predict the chances of an eruption, nor to provide an environmental assessment. Instead it aims to “facilitate modelling of the ‘Laki‐type eruption scenario’ and government planning for a future large magnitude fissure eruption in Iceland and also to engage the interest of the scientific research community“. Drawing on expertise from a wide range of sectors, the study looked at how a Laki-type eruption, which is recognised as the worst-case scenario, might affect the population of the United Kingdom and how that might be addressed. Predicting an eruption in terms of date is not realistic and any precursors are likely to give relatively little notice of a coming eruption – as the report notes, rather wryly, “it is still not possible to reliably predict the precise start of an eruption and high levels of seismic activity (‘seismic crises’) do not always lead to eruptions“. Iceland’s volcanoes erupt regularly – on average, once every five years or so – and mostly do so quietly and unobtrusively. But Eyjafjallajokull provided a reminder of the power and influence of even smaller eruptions, making it prudent to plan for a larger event. The report concluded that there’s much which can still be done in terms of monitoring and understanding the complex volcanic activity in the North Atlantic island. It’s perhaps disappointing for the headline writers that Iceland has no ‘supervolcanoes’. But history shows that smaller eruptions can be damaging enough. Francis, Peter. Volcanoes. (2004). Oxford University Press.